To the layman, it probably seems like a cotton roll is a simple, straightforward dental product. However, there can be some variance between different dental cotton rolls, especially when quality can differ from brand to brand. For dental professionals, there are specific qualities to look for when choosing this particular product. What Are Important Qualities in a Dental Cotton Roll? Cotton rolls must provide wicking action for a drier field, so absorbency is a crucial characteristic. For example, some products have a starch coating, making them less absorbant. Cotton rolls need to hold up without needing to be constantly replaced during procedures. Inferior products can cause interruptions and—since you’re using more per procedure—higher costs. For safety’s sake—as well as patient peace of mind—using medical-grade products is important. Compatibility with an infection control dispenser is a huge plus, whether you’re filling a cavity, undertaking a restorative procedure, or providing a whitening treatment. The best cotton rolls do not use chemicals that can cause the cotton to stick to tissue. When this happens, removal can lead to painful sloughing or ulcers for your patients. orthodontic brackets, or bleaching, while smaller sizes work well for other routine, operative, and restorative procedures. 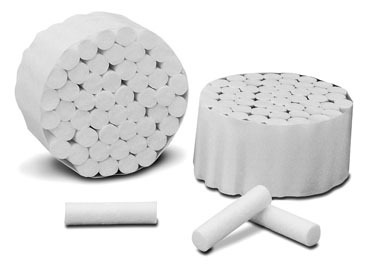 Flexible cotton rolls will provide a secure fit into the buccal curvature and the sublingual space when necessary. What Are the Different Types of Dental Cotton Rolls? Among the three options discussed below, the difference in absorbability, durability, and flexibility will vary based on the quality of cotton used (and many vendors offer sterile options, as well as various sizes). When it comes to comfort—arguably the most important factor—there are significant differences. Made of cotton, this option often has a starch coating, which can stick to the mucosa and cause the painful problems we discussed earlier. So why would a dental professional use this product? Because it’s cheaper. Here, 100% cotton is wrapped in non-woven fabric sealed with an FDA-approved adhesive. The wrap is important because it’s used in place of starch, which means this cotton roll option will not stick to the mucosa, making it a comfortable option for patients. Braided cotton rolls are usually the preferred choice of dental professionals. The braided roll is held together with silky yarn instead of chemicals, so it doesn’t stick to the mucosa, either. In addition, braided rolls have wicking properties that provide a drier field, along with outstanding durability. As a superior product, this option typically carries a higher price tag. Which Dental Cotton Roll Option Should You Choose? Ultimately, dental professionals have their own business decisions to take into consideration. But cost aside, it’s hard to imagine why one would not choose high-quality products that offer the key traits we’ve discussed above. While each trait is important, comfort is the one that we continually circle back to. Along with overall performance, patient comfort often drives the decision-making of many dental professionals. While we’ve asked a handful of questions today, we’ll finish with one more: If you were a dental patient, which dental cotton roll option would you prefer? One that offers superior performance and comfort, or one that doesn’t? We think there’s an obvious answer. Want to sample one of our wrapped or braided cotton rolls, or learn more about our infection control dispensers? Then we hope you'll get in touch.